WASHINGTON - If the cardiologist's warnings don't scare you, consider this: Controlling blood pressure just might be the best protection yet known against dementia. In a flurry of new research, scientists scanned people's brains to show hypertension fuels a kind of scarring linked to later development of Alzheimer's disease and other dementias. Those scars can start building up in middle age, decades before memory problems will appear. The evidence is strong enough that the National Institutes of Health soon will begin enrolling thousands of hypertension sufferers in a major study to see if aggressive treatment - pushing blood pressure lower than currently recommended - better protects not just their hearts but their brains. "If you look ... for things that we can prevent that lead to cognitive decline in the elderly, hypertension is at the top of the list," Dr. Walter Koroshetz, deputy director of NIH's National Institute of Neurological Disorders and Stroke, told The Associated Press. Age is the biggest risk factor for Alzheimer's disease and other forms of dementia that affect about one in eight people 65 or older. Scientists have long noticed that some of the same triggers for heart disease - high blood pressure, obesity, diabetes - seem to increase the risk of dementia, too. But for years, they thought that link was with "vascular dementia," memory problems usually linked to small strokes, and not the scarier classic Alzheimer's disease. Now those lines are blurring as specialists realize that many if not most patients have a mix of the two dementias. Somehow, factors like hypertension - blood pressure readings of 140 over 90 or higher - that weaken arteries also seem to spur Alzheimer's disease-like processes. One suspect: Scarring known as white matter lesions. White matter acts as the brain's telephone network, a system of axons, or nerve fibers, that allow brain cells to communicate with each other. Even slightly elevated blood pressure can damage the tiny blood vessels that nourish white matter, interrupting those signals. -MRI scans showed women 65 and older with high blood pressure had significantly more white matter lesions in their brains eight years later. The study included 1,403 women who were enrolled in a memory subset of the landmark Women's Health Initiative that tracked postmenopausal health. 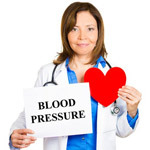 The worse their blood pressure, the higher volume of white matter damage, says the study published online last month in the Journal of Clinical Hypertension. "This is a silent disease in the brain," says lead researcher Dr. Lewis Kuller of the University of Pittsburgh. "It's evolving over time and it leads to very bad outcomes." -The journal Stroke just published similar evidence from a Johns Hopkins University-led study that tracked 983 people for more than 15 years, starting in middle age. The longer people spent with uncontrolled high blood pressure, the more white matter damage they accumulated. The researchers could see a change with each 20-point jump in too-high systolic pressure, the top number in a blood-pressure reading. Clearly, hypertension alone doesn't doom someone to later dementia. Far more people, nearly one in three U.S. adults, have hypertension. And there are plenty of other reasons to lower blood pressure: Hypertension is a leading cause of heart attacks, strokes and kidney failure. But while some studies have found hypertension treatment lowered the dementia risk, others haven't. Enter the NIH's SPRINT study, which in a few months is to begin enrolling 7,500 hypertension patients age 55 and older around the country. The test: Whether aggressive treatment to lower systolic blood pressure below 120 - what's considered normal - will prove healthier than today's guidelines that urge getting it below 140, or 130 for diabetics. The main focus is on heart and kidney health. But all participants will be screened for dementia, and a subset will undergo repeated cognitive testing and MRI scans to tell if lowering blood pressure also protects against a slide toward dementia. Another question: If older patients can tolerate bigger than usual blood pressure drops without side effects, such as falls. With dementia rising fast as the population grays, even a small effect from better blood pressure control could have a big public health impact, says Dr. William Thies of the Alzheimer's Association. Other dementia-preventing efforts, such as targeting the sticky amyloid plaques in Alzheimer's patients brains, haven't panned out so far - while hypertension control has little downside, notes Pittsburgh's Kuller. "Until I can tell you how to get rid of amyloid in your brain, take care of the blood pressure."